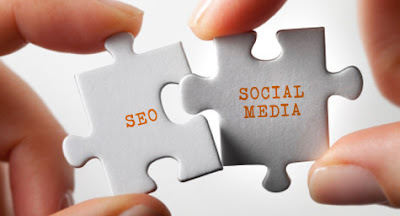 Social Media Marketing and SEO are two tightly interwoven strategies. Both are organic, inbound strategies that focus on building an appealing identity that naturally attracts visitors. Since social media relies on high-quality content and a visible, strong brand presence, the efforts you spend on SEO can doubly improve your social media reach, and as most search marketers will tell you, your social media presence can greatly increase your search rankings. Unfortunately, when discussing how social media can influence your Google rankings, most search marketers leave out the details. Rather than discussing exactly how and why increased social media attention can improve your SEO, it’s written off as a generality, leaving social media marketers to wonder whether their strategies are actually effective. The total number of followers and connections your social media profiles contain does have a significant influence on your rankings. A company with 100 Twitter followers won’t receive nearly the ranking bonus of a mega-corporation with a million Facebook likes and a million Twitter followers. However, there are some stipulations to this; Google can detect the quality of your followers, meaning buying 100,000 proxy Twitter followers isn’t going to do much for your overall rankings. Instead, you’ll need to build your following organically. Growing your number of followers is a slow process, but effective so long as you’re consistent. Present your brand uniquely and consistently, using the same voice to update your users on a daily basis. Post useful articles, helpful tips, open inquiries, and general discussion items, then follow up with your users by engaging with them in conversation directly. Conversations and direct customer engagements are the key to building and retaining a sizable, interactive following, since they encourage current followers to return and help build your authority for new, potential followers. Social media is also useful because it encourages more external sites to link to your content, and the more diverse external links you have, the more authority you’ll gain in Google’s eyes. Of course, the catch to this is that you have to have high-quality, authoritative content to begin with. Otherwise, you’ll have nothing to use to attract links. In this case, social media serves simply as a broadcast channel. Your content, assuming it’s original and useful, is going to serve as bait, and your social channels are going to serve as fishing poles, putting the bait in front of the right eyes. Use hashtags to gain visibility for your initial rounds of syndication, and don’t hesitate to bring your content into existing threads and discussions. Doing so will improve your social reputation as an authoritative leader, but more importantly, it will maximize your potential external link sources. This strategy also relies upon pre-existing content, but it opens a secondary channel for search. In addition to news articles and Knowledge Graph entries, Google also tends to favor popular social media updates in the top sections of its SERPs. It’s a key, somewhat temporary position you can attain by making sure your posts are optimized for the opportunity. First, you’re going to need a strong anchor for your post. That can be a video, an infographic, or even a link to a full-detailed article. Whatever it is, it’s going to serve as your foundation, and you’ll need to title it in an accurate, descriptive way. Next, when you post it, frame your foundation with text that’s optimized for a specific type of search. For example, if you’ve written a detailed article on best practices for making oatmeal cookies, you could frame it with a specific query like “Have you ever wondered how to make the perfect oatmeal cookie?” You can even throw seasonal keywords into the mix to maximize your timeliness and your chances of coming up in search results. Social sharing contributes to a brand’s authority much in the same way that external links do. To search engines like Google, any indication of a verifiable external source validating your brand or your content is grounds for a small improvement in domain authority. So, if you can get five people to share your Facebook post, that’s great, but if you can get 1,000 people to share it, that’s even better. Likes, shares, favorites, replies, and retweets all count toward this increased authority. The best way to encourage increased social sharing is to appeal to it directly. For example, you could offer a specific reward for people sharing your post, like entry in a drawing for a substantial prize. You could also do interactive surveys which encourage people to “like” a post if they agree with you on an issue, or if they’re interested in seeing specific types of new content. The best part of this strategy is that it’s a self-perpetuating cycle; the more people share your content, the more new followers you’ll win, and the more followers you have, the more shares you’ll get. The following infographic illustrates how social shares impact SEO, according to two popular correlation studies. Social media also provides a perfect opportunity to engage yourself in the local community, sending local-specific authority signals to major search engines. There are a few ways to do this, but the two easiest are making updates whenever your company gets involved in a local event and interacting with other local brands and establishments on social media. The first is relatively straightforward; any time your company attends a local festival, tradeshow, or other event, take pictures and make a post, inviting other local residents to comment. This reinforces your participation in the community, and makes you more visible in local searches. The second takes a bit of research; perform some searches for local players, and try engaging with them on a regular basis. You can share each other’s posts, get involved in each other’s discussions, or even post guest blogs on each other’s sites, and share them on your social channels. This may seem like more of a branding advantage than a specific SEO advantage, but the SEO benefit is significant. Increasing your reputation on social media, through increased engagement and high-quality content syndication, will lead to increased online brand presence. That increased brand presence is going to lead to more branded searches on Google, and the more branded searches your brand receives, the higher it’s likely to rank for non-branded keywords. It’s a complicated relationship, but it begins with having a strong brand presence on social media and ends with greater search visibility across the board. There’s no specific way to improve your authority other than to give your audience a quality experience, but that’s where it all begins. For the most part, these are staple elements of a successful social media marketing campaign, and as with most SEO strategies, it comes down to one basic principle: the better experience you give your users, the higher you’re going to rank in Google. Understanding the root causes for social media’s effects on SEO can help you better direct and manage your campaign, ultimately giving your users a better experience, and opening the widest possible channel for new potential customers to find your brand. Forbes.com (Jayson DeMers) original source - Thanks for this great article!